The Dodgers crushed the Padres, as has become the custom on opening day. Clayton Kershaw got the win in seven innings of one-hit baseball; Chase Utley made six plate appearances, getting on base three times including being hit once by a pitch in his second plate appearance. He knows what he did.1 The Dodgers have beaten the Padres on four opening days since 2009, including last year; San Diego beat the Dodgers on opening day in 2014. 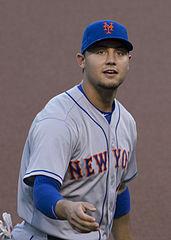 Back on Sunday, Michael Conforto got on base four times as the DH for the Mets with a hit, a double, and two walks, giving him four plate appearances with an OBP of 1.000. Xavier Nady did the same thing for the Mets in 2006 with two singles and two doubles. The most plate appearances by a Met with an opening day OBP of 1.000 were Kazuo Matsui (2004) and Darryl Strawberry (1988); Hideki Matsui (2006), Carlos Delgado (2002), Darren Lewis (1992) and Dee Fondy (1954) each had six. Finally, the Giants and the Rockies each knocked in four homers in their opening day contests. The Giants’ total included consecutive eighth-inning homers by Denard Span, Joe Panik, and Buster Posey. The 1988 Mets had 6 opening-day homers, although the game was more notable as David Cone‘s final career hold; he had three, and the other two were in 1987. 1 Yes, yes, it was accidental. He knows what he did. Unrelated, Damian at Sons of Sam Horn is keeping a close eye on his slides this year.